Ratatouille is a meal in itself (think of it with a good, crusty bread) but I served it with Herb Crusted Tilapia this week, so I know it makes a marvelous side dish, too. 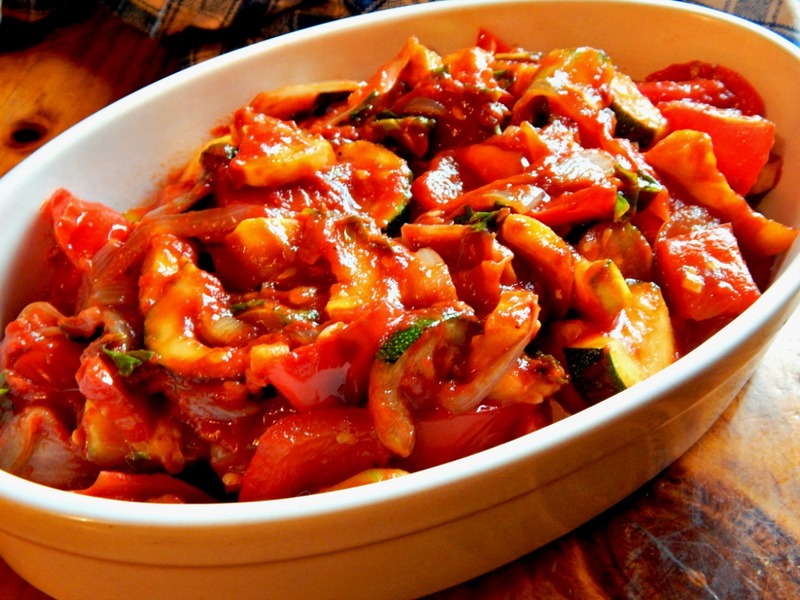 The great thing about Ratatouille is that I find that even the vegetables that I (or my kids) don’t like as much get eaten, because they blend in with the flavors we love – bonus, because I like to serve as wide of variety of vegetables that I can. I read somewhere it takes an average of eight different tries to like a food taste. Think of babies eating – they spit it out, we scoop it up and put it back in, and then serve it again and again, and eventually they lap it up. I’ve spoken before about my “one bite rule.” In my home I expect my kids to try a bite of everything on their plate, and the reason – to slowly nudge them over to new and different tastes. Cut eggplant lengthwise in half, then in half again, keeping the stem end intact. (You are basically quartering it.) Slice through the quarters into inch wide pieces. Slice zucchini into one inch slices – if it’s large, half or quarter, just like the eggplant, then slice. Chunk the bell pepper into bite sized pieces. Peel and half the onions and then slice pole to pole. Cut the tomato into roughly one inch pieces. In a large skillet, add 1/2 cup of the olive oil and heat till very hot. Having your olive oil at the right temperature helps keep the eggplant from absorbing too much oil. Add eggplant and cook until it’s just browning, soft and wilted, about 10 to 12 minutes. Remove to a large plate and spread out on paper towels. Add another 1/4 cup of olive oil, and when heated, add the zucchini to the pan and cook until just wilted. Remove them from the pan and place with the eggplant. Add in another 1/4 cup of olive oil and the onion, anchovies and herbs. Cook until softened and the onions are beginning to brown and carmelize, five to seven minutes. About halfway through, add in the red peppers. Add in the garlic and cook for a minute or two. Push the vegetables aside and add a tablespoon or two of tomato paste. Briefly heat through, then stir into the rest of the ingredients in the pan. Add the tomato and heat through, then return the eggplant and zucchini to the pan. Open up the red chile and sprinkle over, stirring in. Taste for seasoning and add salt and pepper as desired. Now, here’s your choice: For a fresher ratatouille (my preference, especially in summer) you can heat it all through and serve (preferably at room temperature) or you can continue to cook over low heat for 15 to 20 minutes until everything is softened, melded together and juicy. I use the higher amount of tomato if I’m using this method. Finish with a splash of vinegar and a sprinkling of herbs. I think the vinegar is REALLY key in this dish. Note: I often just eyeball how much olive oil to use. The eggplant can soak up quite a bit, but I think I generally use far less than stated. As mentioned before, use your favorite vegetables and seasonings. You can cut down on the olive oil – although it’s important as a flavoring as well as an ingredients – use a nonstick skillet and a thinner coating – if it starts to dry, add a little water and steam. I happened to have some Sofrito in my freezer, and I love to use a bit in a dish like this instead of the tomato paste. Not traditional by any means, but I love to throw a few pitted Kalamata olives in mine, especially if I’m not serving with any meats. Have leftovers you’re afraid you won’t use? Throw them in a blender for a super healthy smoothie or gazpacho type soup. Consider, perhaps, using left over Ratatouille in Chicken Italiano instead of the tomatoes the recipe calls for – since the Ratatouille is already cooked, just add it in before baking. This entry was posted in Click here for Bargain Meals, Click here for Fabulous Food Posts and tagged Anchovy, complete skillet meal, Easy Recipe, Eggplant, Heritage Recipe, Olive oil, Ratatouille, Tomatoes, Tyler Florence, Vegetable Side, Vegetarian Meal, Zucchini. Bookmark the permalink. One of our favorites…nice recipe.. I SO love it when people eat their veggies! Thanks!